ONLINE STORE IS UP AND DAMN RUNNING!! 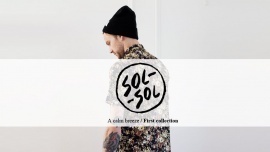 Sol-Sol is a menswear label hailing from Durban, South Africa Im 27 years old..
Our focus is good quality mens basics with small added details here and there. Our roots have always been in the surf, skate, streetwear cultures and now that has combined with the slightly more sophisticated #menswear clothing scene I have matured in. I have been involved in clothing and retail for close to 10 years, from working on the floor, to designing, to starting my own t-shirt range to buying and planning for some big retailers with the ultimate goal of eventually starting up my own line - this year I have taken the bull by the horns and started that project feeling finally I am in the right place and have enough experience in all fields to do it properly.. I have gone the t-shirt route before around two years ago with http://www.iammonster.co.za I learnt and lost a lot, all of this was extremely crucial in setting up the building blocks to start up a full menswear line, learnt from my mistakes, built on the successes. We are hoping to launch early 2014 in South Africa and in Seoul where my brother lives. He set up the street fashion website http://sol-sol-street.tumblr.com which has created a massive hype in Seoul without people even knowing that a clothing line is on the way. This was our goal to create a massive following and brand identity before sewing our first stitch.. We havent gone ahead with any production yet as we are still putting the final touches on the range. To be honest I really only plan to pursue the production once I have buyers/stores on board. So this is it for us, we have a sales trip planned later this year which will hopefully work out, and hopefully some success with this awesome competition and we can launch SOL-SOL to the world.... If she will have us. I have really tried to create a succint range that I am extremely happy with. I wanted to design the range so that someone can walk into a store and literally buy head to toe SOL-SOL and look great and not feel like a chump. But also so that someone can walk in and buy just a jacket or a shirt or a chino and it will work well with whatever they have at home (or with whatever else the merchandisers/buyers have else in there stores). Below I have given some info on the pieces in the range. I am definatley aiming my brand at the boutiques and a couple online stores that fall into those same categories. (Collette, REED space, Brown Breath, oki-ni, hypebeast.) I have Identified how much I will need to mark up each garment to break even and then go on to make profits, hoping to get some help from Jeff as to what that price should be to fit into those stores, and also still be a reasonable price point. Black Parka -really proud of this! It is made with a heavy, durable, slightly waxed cotton. We havent lined it at all so that you can wear it comfortably in summer and also can layer it up in winter. It has a hood that can be zipped into the collar if you wish. The outlook on the front is extemely clean and smart with just 2 pockets at the waist, with secret side entry pockets beneath those. Shirts - I have broken the shirts up. The long sleeves comprise of a classic oxford button down in a very light grey, the fabric is insane. Its a classic that can be dressed up or down no matter what. I have the engineered chambray shirt and a classic workmans heavy cotton shirt in blue. On the short sleeves I have gone with the boldest pieces in the range and I believe thats what s/s shirts are for, I have gone with florals which I have always liked. These florals also tie back into the caps and also into the small details on the pants. Pants - These are probably my favourite pieces in the range, they are a skinny/slim fit with a slight drop crotch and classic chino styling (I like the juxtapostion of the classic styling on this new fit). The fabric is the hero here, you pick it up and its heavy and stiff with a great handfeel, But it has a very slight stretch in it, which meansits comfortable, you can manouvere easlisy riding your bike or skating. The great thing is it doesnt feel like you are wearing a stretch pant at all, its just when you need that little strecth for whatever reason - boom there it is. There are also great little subtle styling features, pocket bags/binding/inner waistband etc are little hints of florals tieing in the range together. Also have the 2 denim jackets, a classic Indigo heavy denim, with some nice branded buttons. The fit is a biker style that sits just above your hip and is nicely fitted around your arms and waist. We also have a waxed and washed out black jacket witht he same fit but different styling with pockets and panels..
hats - We have gone with 5 panels, which I love. Two are darker cleaner caps to fit into the range nicely, black with a dark chocolate peak. Grey with a graphite colour peak. We have also gone with a cool floral/jungle inspried print to keep (hopefully) the 5 panel collectors happy. 2 beanies, super soft, super comfortable black for the more reserved guy and a bright orange to add that statement piece to your outfit. Look forward to your guys feedback please.. These are some more detailed shots of just product, how it would be viewed on the online store to show details, each piece would probably have about 5 different shots. Below you can see various ways we have used our logos for different peices. Printed onto inside back neck for tees. Printed onto canvas labels for the beanies, satin woven labels for pants and knitwear. You can also see some of the detail on the pants like our different floral and paisley inner wasitband and binding patterns. You can also see the small 'you look good' label on the inside fly. Just to give you that added boost of confidence while youre getting dressed. You can also see the sol-sol branded metal buttons on the jacket. Only the bottom button is branded with the name, the rest of the buttons in th eplacket leading up to the neck, just have the 2 dashes from the logo - though it would be to much to have every button branded..
Swingtags, business cards and lookbook. Below is obviously just a mock up of what a possible store front might look like.. Inside of the store will be a real life 3D version of the lookbook, super clean, all white, lots of negative space, white wooden floor or concrete screed, white rails hanging from the ceiling, table in the middle displaying garments folded and caps. Also a must is 2 benches in the corner with a coffee machine. Also will be our monthly SOL-SOL paper. Hey guys I have just uploaded possibly the worst video in youtube history, but its for the adaptibility test, please just see it for what it is.... haha oh my god its so bad... cool here it is.. Also in South Africa we have eleven different National languages, the people in this video main laguages are English, Afrikaans and Zulu..
Below is to show some previous samples and how I worked to get the eventual final samples. This is obviously only for the smaller details and not for the bigger details like fabric and fit etc, but still to show some of the procedure. You can also see the previous name I had 'the basics', but I changed this as it was just far to common with many brands and companies using variations of that name. Branding on a car would be as subtle as possible.. Probably just one big main logo on the back with smaller ones around. In the process of setting up our site, this is what it will look like.. This is the start of the 'Day in the life' series, foucssing on select individuals who fall in line with our brand, this is Richard Phipson, a tattoo artist from Hong Kong currently working in London. Next up will be 2 cool baristas and Nev a Barber from my hometown. All these will obviosuly only drop publicly when we go 'live' and start all our marketing and social media properly..
Next day in the life are 2 of the baristas from the factory cafe, 2 of the coolest kids around Wade and Brandon. This is my local and these guys make the best damn coffee in town! So stoked we got a cool little mention on HYPEBEAST this morning - go check it out! Below are some more pics from that..